Box jumps are a great approach to building explosive power in your lower body. 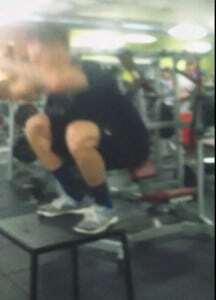 The more power you generate in the limited distance you have (leg height) the higher you will jump. This power translates into more bar weight in your squats and deadlifts. Select a box you are able to safely jump onto. There’s no real science here, you will want to pick a box that you can easily clear with your feet and land on the center of the box. Missing the box can have dramatically painful results. Stance/Foot Position: Use a foot position that is comfortable for jumping. 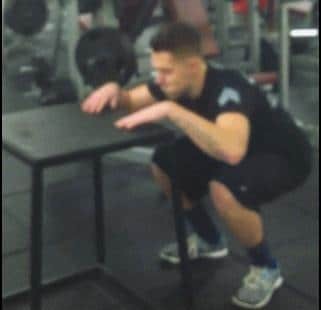 This can range from a close stance with your toes pointed forward, such as Olympic style lifting or conventional deadlift stance, to a narrow squat stance with your toes pointed out. Hand/Arm Position: You may use your hands and arms as necessary to maintain balance during the jump. Start by standing in front of the box, slightly back so you can clear the top front edge as you jump onto it. Drop your hips down to engage your legs decisively in the jump. Failure to drop into the jump will result in using less of your glutes, hamstrings and quads, and shift emphasis to your calves to perform the jump. Concentrate on the box and try to land in the center of the box. Don’t face the mirror as you jump. Diverting your attention from the box can increase your chance of missing the box or catching the front edge of the box with your feet. Use your legs to absorb the landing so that you land very softly. Try and land soft enough so that you don’t hear your feet landing on the box. As you come back up from the landing, jump back down to the floor. Again, absorb the force and land softly onto the floor and rebound into your next jump. Use a box you can clear with your feet easily without bringing your knees up too high. Using a box that is too high can result in catching your toes/feet on the corner of the box which can be disastrous. The idea is to maximize the height of your jump – raising your knees and feet excessively to land on a higher box doesn’t help with the lift or to build power. Focus on jumping as high as possible, and only move up in box height when you can clear that box. Between boxes of different heights you may consider adding a flat plate to the box as an interim height. As with dynamic/speed lifts, when the speed and explosiveness wanes, end your set – sets should be fewer, more explosive reps. Using a box that is too high: Select a box that you can completely clear the edges of the box when you jump and land in the center of the box. If you are just clearing the box, and landing with your toes on the edge, begin with a lower box and concentrate on increasing the height of your jumps before moving up. Raising your knees and feet to clear a higher box: Focus on driving your body up higher, not simply raising your feet higher to clear a higher box. The intent is to generate maximal power and drive your entire body upward as high as possible. Use a box height that you can completely clear. You should be able to jump well above the edge of the box and land in the center of the box. If you begin to tire and drift closer to the edge of the box end your set. If you miss the box your shins will drag all the way down the corner of the box leaving permanent scars.